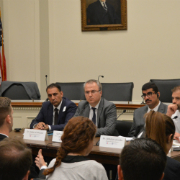 On June 6th, Matt Olsen, former Director of the National Counter Terrorism Center, joined participants in the Congressional Partnership Program for an off-the-record dinner discussion on counter-terrorism strategies. Matt Olsen has served as a leading government official on a range of national security, intelligence, and law enforcement issues. Mr. Olsen served for three years as the Director of the National Counterterrorism Center. Created by Congress in response to the attacks of September 11, 2001, NCTC is responsible for the integration and analysis of terrorism information and strategic operational planning. Prior to joining NCTC, Mr. Olsen was the General Counsel of the National Security Agency, serving as the agency’s chief legal officer. For twelve years, Mr. Olsen was a federal prosecutor in Washington, D.C., prosecuting violent gang members, terrorists, and white-collar criminals. Mr. Olsen served as Special Counsel to the Director of the Federal Bureau of Investigation. He began his public service career as a trial attorney in the Civil Rights Division of the Department of Justice. Mr. Olsen currently is an executive at a cyber security technology firm, a lecturer at Harvard Law School, and ABC News analyst. He graduated from the University of Virginia and Harvard Law School.